In respect of its listed equity strategy, Temporis’ delivery of best execution is a key element in its commitment to act in the best interests of its clients, as well as being a regulatory requirement. It is recognised that different strategies and different asset classes require different considerations, however best execution must be achieved on a consistent basis in all scenarios. This policy is intended to serve as a reference point for the investment team to ensure that appropriate considerations are taken into account during the execution process. Temporis is required to take all sufficient steps to obtain the best possible result for its clients when it executes, places or transmits orders on their behalf, taking into account price, costs, speed, likelihood of execution and settlement, size, nature or any other consideration relevant to the execution of the order (referred to as the ‘execution factors’). the execution venues to which that order could be directed. Temporis may execute client orders directly or indirectly based upon the relevant asset classes. Direct orders refer to orders that Temporis has sole discretion for over all parts of the execution, including the execution venue and exact execution timing. Indirect orders are orders where partial or entire execution discretion is delegated to a third party, such as where the Firm places an order with a broker for execution who executes the transaction using an execution algorithm. This policy covers Temporis’ approach to best execution in both instances. Execution venues currently comprise of brokers but may in the future also include regulated markets, MTFs, OTFs, systematic internalisers, market makers or other liquidity providers. The relative importance of the execution factors are judged on an order-by-order basis in line with the Firm’s industry experience and prevailing market conditions. Currently the only instruments traded are equities and are generally highly liquid, therefore it has been concluded that price will usually be the primary factor when considering which broker to use. However, for large volume orders or illiquid stock, execution factors other than price (for example, speed and likelihood of execution) may be given a higher weighting. Temporis will analyse all available information to direct an order placed on behalf of a client to the appropriate venue taking into account the execution factors and their relative importance. The impact of implicit costs must be taken into account when considering the execution strategy of orders to ensure that they are managed and do not result in an undue impact to total costs. 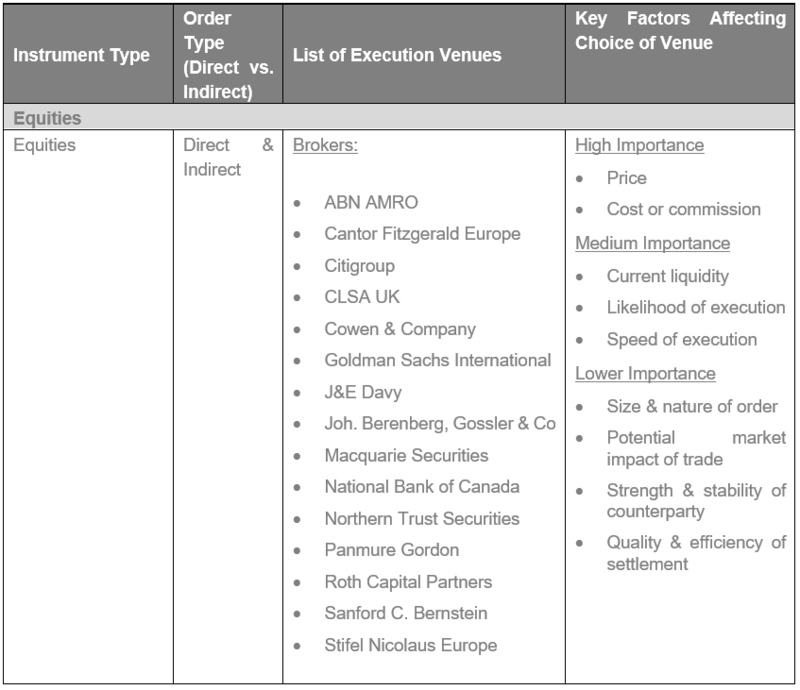 Below is a list of approved execution venues (brokers) for the instrument types traded (currently equities) and the key factors affecting the choice. All orders must be placed with a broker from this list. Additions to the broker list are typically proposed by the Portfolio Manager and approved by the Compliance Officer and a Director following appropriate due diligence, which will usually include; market reputation, credit and counterparty risk, level of service, and market coverage. The annually published execution data made available by brokers under MiFID II will also be relevant. A Dealing Oversight Group, comprising the Compliance Officer and relevant directors of the Firm oversee different aspects of the deal process (e.g. daily trade review, changes to execution arrangements, policy updates, MiFID II disclosures on deal execution quality, review of dealing errors and breaches). In addition, the Compliance Officer undertakes independent monitoring of the key elements of the dealing process to ensure compliance with applicable FCA requirements. The Firm manages the segregated portfolio of listed equities on a discretionary basis and, as such, it does not receive specific instructions from clients. It should be noted however that if specific instructions are received, Temporis will give priority to that instruction over the provision of this policy. While the Firm will attempt to provide best execution as far as possible, any such instructions may prevent the Firm from taking steps that it has designed and implemented in this policy to obtain the best possible result in relation to the execution of those orders with respect to the elements covered by those instructions. Temporis continually (and formally at least annually) reviews the effectiveness of this policy and its execution arrangements to identify and, where appropriate, incorporate any changes to enhance the quality of execution obtained. Temporis provides all its clients with a copy of its Best Execution Policy (otherwise known as an Order Execution Policy) and confirms their consent in writing (or by email) to it prior to the provision of services. Temporis will notify its clients of any material changes to this policy. A change is material where it would affect the best execution parameters and/or its disclosure is necessary to enable clients to make a properly informed decision about whether to continue utilising the services of the Firm. On an annual basis, Temporis summarises and makes public, for each class of financial instrument, the top five entities in terms of trading volumes where the Firm transmitted or placed orders for execution in the preceding year. an explanation of how the Firm has used any data or tools relating to quality of execution published by execution venues. Temporis publishes this information on the Firm’s website in a machine-readable electronic format available for download by the public.